At 0:25 AM, CET of September 21, the Spain 1 balloon landed on the southern tip of Italy, leaving only the Swiss 1 & 2 balloons as the remaining teams still flying.As of 8:00 PM, CET of September 20, only three teams remain aloft. In order of distance flown they are: Spain 1, Switzerland 2 and Switzerland 1. As of 6:00 PM, CET of September 20, there are seven teams still competing, out of 24 that originally launched near midnight on September 18. The remaining teams (in order of distance flown) are: Spain 1, Switzerland 2, Switzerland 1, Austria 1, Poland 2, Poland 1 and Germany 1. Three balloon teams have landed this morning, the first to land during the Coupe Aéronautique Gordon Bennett 2016. They are: GBR-01, AUS, and SUI-03. Event director Stefan Handl said the teams had to land because of late-notice military airspace. A military NOTAM (notification to airmen) was issued at 6am (CET) today, which covered an area of Belgium, Netherlands and Germany. The Notam was in place due to a military exercise that is taking place today. In this instance it would not be possible for balloons to enter the airspace, therefore they must land. The pilots of all three teams have landed safely and reported back to the competition HQ. 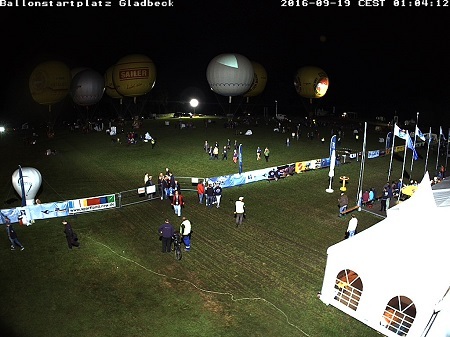 After a two day delay due to weather conditions, the balloons are launching from Gladbeck, Germany. The Gordon Bennett competition is the Fédération Aéronautique Internationale (FAI) World Long Distance Gas Balloon Championship. Screen shot of the live webcam broadcast of the launch from Gladbeck, Germany. 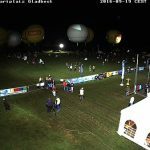 This entry was posted in Balloons, Gas Balloons and tagged Coupe Aéronautique Gordon Bennett, FAI World Long Distance Gas Balloon Championship, gas balloon, Gladbeck Germany, helium balloon. Bookmark the permalink.